Natalie Short from the Bundjulang tribe and her family. More Aboriginal children than ever are protected against vaccine-preventable diseases thanks to the work of the Western Sydney Local Health District (WSLHD). Ninety-five per cent of Aboriginal children are now fully vaccinated at 12 months in western Sydney and 98.5 per cent are fully vaccinated at five years. The results have been achieved with the help of the local health district’s Aboriginal health workers who assist parents and carers in getting their children vaccinated on time. 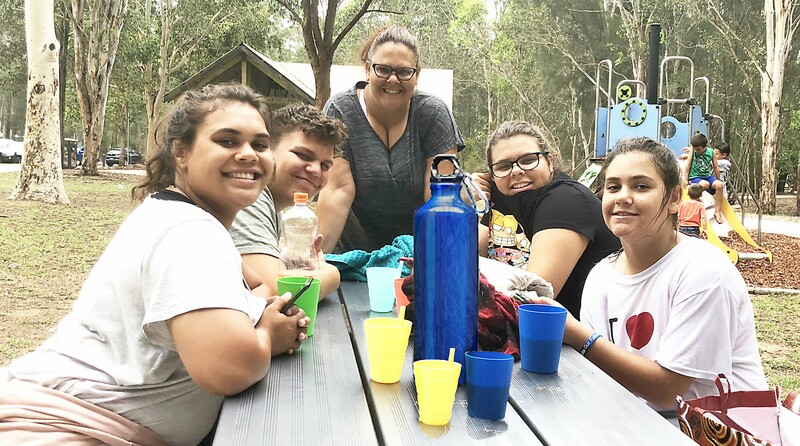 WSLHD Aboriginal immunisation healthcare worker Joanne Cheatham said she helps families get connected to the right community programs, healthcare workers and other support services. “Working together, maintaining partnerships and support networks is crucial to achieve the best outcomes for our families,” Ms Cheatham said. Deputy Population Health Director Christine Newman said providing support for immunisation is an important part of closing the gap for our Aboriginal community. “Immunisation is vital to ensuring good health and immunity against vaccine-preventable diseases for individuals and the whole community,” Ms Newman said. Western Sydney mother of four Natalie Short from the Bundjulang tribe said immunisation has safeguarded her kids from avoidable diseases. “Aboriginal people have a high risk of sickness and early death,” Ms Short said. The NSW Government’s 2017-18 Budget for immunisation is $22.75 million. This year the NSW Government has committed $1.75 million for an immunisation and influenza prevention campaign. The latest data from the Australian Immunisation Register shows vaccination rates in New South Wales are at their highest level ever. In 2017, 93.8 per cent of five year old children were fully vaccinated, a 6.3 per cent increase from 2010. Vaccination is the best way to protect your child from serious diseases as the broader community. Dry July: Support our cancer centres!